satrap \SEY-trap\, noun:1. a subordinate ruler, often a despotic one. 2. a governor of a province under the ancient Persian monarchy. A Medieval word, satrap originated in the Old Persian from the literary prefix kshathrapavan-, meaning "guardian of the realm." Covers of Persepolis Books 1 and 2PublisherL'AssociationDate2000Creative teamWriter(s)Marjane SatrapiArtist(s)Marjane SatrapiOriginal publicationDate(s) of publication2000ISBN2844140580TranslationPublisherPantheon BooksDate2003, 2004, 2005ISBN0-224-08039-3Persepolis is a French-language autobiographical graphic novel by Marjane Satrapi depicting her childhood up to her early adult years in Iran during and after the Islamic revolution. The title is a reference to the ancient capital of thePersian Empire, Persepolis. Newsweek ranked the book #5 on its list of the ten best fiction books of the decade. Drawn in black and white, the comic found great popularity following its release, and was translated into several languages. The English edition combines the first two French books and was translated by Blake Ferris and Satrapi's husband, Mattias Ripa. 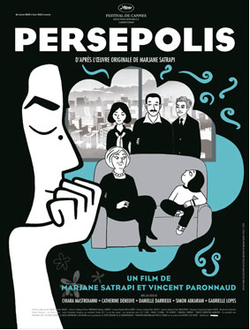 The French editions of Persepolis 3 and Persepolis 4 were combined into a single volume,Persepolis 2 for the United States market. 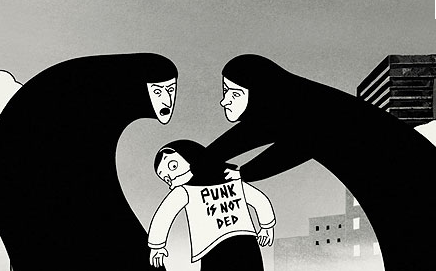 In the U.S., the Persepolis series is published by Pantheon Books. In 2007, an animated film adaptation of the comic was created, with author Satrapi co-directing with French comic artist Vincent Paronnaud. The film utilized the same style of the comic, although there are a handful of scenes in the present day that are shown in color, while the rest of the flashback events are illustrated in black and white, as in the novel. The film opened in various countries to critical acclaim and received an Oscar nomination for Best Animated Feature at the United States Academy Awards. Satrapi responds to critics who labeled her graphic novel "anti-Iranian".